Artists’ Reception: Friday, Dec. 7, 5 – 10 p.m.
For its holiday exhibition at Gallery 80808/Vista Studios in Columbia, S.C., if ART presents Construction Crew III, a group exhibition with work by South Carolina artists Steven Chapp, Jeff Donovan, Janet Orselli and Edward Rice. 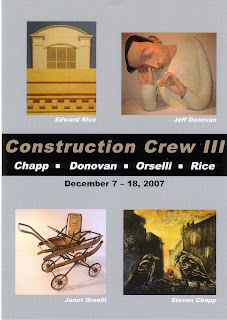 Like the first two if ART Construction Crew exhibitions in December 2005 and 2006, the show consists of two-dimensional and three-dimensional art that has strong constructional or architectural characteristics. The exhibition opens Friday, Dec. 7, with a reception from 5 –10 p.m. and runs through Dec. 18. Opening hours are weekdays, 11 a.m. – 7 p.m., Saturdays, 11 a.m. – 5 p.m., and Sundays 1 ­ – 5 p.m. Chapp, Donovan, Orselli and Rice are represented by if ART Gallery, 1223 Lincoln St., (803) 238-2351, where additional works of art by all four artists will be on view. Chapp will be showing monotypes, intaglio prints, drawings and paintings from the 1980s through last week. Donovan will present several major new ceramic sculptures. Orselli will show reconstructed and reconfigured old baby-carriages-turned-art-objects. Among the paintings Rice will be showing is a new series of barn paintings, in which the same barn structure is painted a dozen times in different colors. Easley, S.C., native Steven Chapp (b. 1952) is a native of Kansas City, MO. He holds an MFA in printmaking and drawing from Clemson University and a BFA from Appalachian State University. He has shown in galleries and museums throughout the region, including the Greenville County (S.C.) Museum of Art, the Burroughs and Chapin Museum in Myrtle Beach, S.C. and the Pickens County (S.C.) Museum of Art and History. He worked on two projects with artists Christo and Jean Claude, in Kansas City in 1978 and Key Biscayne, Fla., in 1983. Jeff Donovan (b. 1957) has been a fixture on the Columbia, S.C., art scene for many years. The painter and ceramic sculptor was born in Millford, Del., and studied at the Ringling School of Art in Sarasota, Fla., and the Penland School of Crafts in Penland, N.C. Donovan has exhibited widely throughout South and North Carolina. He is represented in the Mark B. Coplan Collection of South Carolina Art, the prominent ceramic sculpture collection of Ron Porter and Joe Price in Columbia and in the collection of Blue Cross Blue Shield of South Carolina. Donovan also works as an art conservator with ReNewell Fine Art Conservation in Columbia. Janet Orselli (b. 1954) was born in Columbia, S.C., where she lived until November 2007, when she moved to Mill Spring, N.C. In 1976, she graduated from Clemson Unversity with a degree in psychology. In the 1990s she gradually switched careers from the field of mental health to art. While establishing herself as an artist, she earned an M.F.A. from Clemson in 2001. She was selected for the 2001 and 2004 South Carolina Triennial exhibitions as well as the 2004 traveling exhibition “South Carolina Birds: A Fine Arts Exhibition.” Earlier this year, Orselli has a solo show at O.K. Harris Gallery in New York City. Orselli has done large installations at the Gibbes Museum in Charleston, S.C., the Burroughs & Chapin Museum in Myrtle Beach, S.C., and Appalachian State University in Boone, N.C. Orselli has received several residencies and fellowships, including at Anderson Ranch in Colorado and in Kaiserslautern, Germany. She is the recipient of a Pollock-Krasner Fellowship. North Augusta, S.C., native Edward Rice (b. 1953) lives in Augusta, Ga. He is one of the Southeast’s most prominent contemporary painters. Rice’s solo exhibitions include those at the Morris Museum of Art in Augusta, the Gibbes Museum of Art in Charleston, S.C., the Greenville County (S.C.) Museum of Art, the Chattahoochee Valley Art Museum in La Grange, Ga., and the McKissick Museum at the University of South Carolina in Columbia, S.C. Rice also was represented in The Story of the South: Art and Culture, 1890 – 2003, the inaugural exhibition at the Ogden Museum of Southern Art in New Orleans. “Edward Rice: Architectural Works, 1978-1998” was published by the Gertrude Herbert Institute of Art in Augusta, Ga., and “Edward Rice: Recent Monotypes,” by the Morris Museum of Art in 2003. From Friday, December 7 through Tuesday, December 18, if ART Gallery will present Contruction Crew III at Gallery 80808, 808 Lady Street in downtown Columbia, South Carolina. The show will feature Steven Chapp, Janet Orselli, Edward Rice, and Vista Studio’s own Jeff Donovan. The artists’ reception will be held on Friday, December 7 from 5 until 10 PM. Additional hours are: Weekdays from 11 Am until 7 Pm: Saturdays from 11 AM until 5 PM; and on Sundays from 1 – 5 PM. For additional information, please contact if ART Gallery owner, Wim Roefs at (803) 238-2351 or call Gallery 80808/Vista Studios directly at (803) 252-6134. Also, visit the gallery’s website at www.gallery80808vistastudios.com.